This article is about the motorcycle division spun off from Yamaha Corporation. For the original Yamaha, see Yamaha Corporation. Yamaha Motor Company Limited (ヤマハ発動機株式会社, Yamaha Hatsudōki Kabushiki-gaisha) is a Japanese manufacturer of motorcycles, marine products such as boats and outboard motors, and other motorized products. The company was established in 1955 upon separation from Yamaha Corporation (however Yamaha Corporation is still the largest shareholder with 12.21%, as of June 30, 2014), and is headquartered in Iwata, Shizuoka, Japan. The company conducts development, production and marketing operations through 109 consolidated subsidiaries as of 2012. Led by Genichi Kawakami, the company’s first president, Yamaha Motor began production of its first product, the YA-1, in 1955. The 125cc motorcycle won the 3rd Mount Fuji Ascent Race in its class. The company's products includes motorcycles, scooters, motorized bicycles, boats, sail boats, personal water craft, swimming pools, utility boats, fishing boats, outboard motors, 4-wheel ATVs, recreational off-road vehicles, go-kart engines, golf carts, multi-purpose engines, electrical generators, water pumps, snowmobiles, small snow throwers, automobile engines, surface mounters, intelligent machinery, industrial-use unmanned helicopters, electrical power units for wheelchairs and helmets. The company is also involved in the import and sales of various types of products, development of tourist businesses and management of leisure, recreational facilities and related services. Yamaha’s motorcycle sales are the second largest in the world outboard motor and Yamaha is the world leader in water vehicle sales. The motorcycle division of Yamaha was founded in 1955, and was headed by Genichi Kawakami. Yamaha's initial product was a 125 cc (7.6 cu in) two-cycle, single cylinder motorcycle, the YA-1, which was a copy of the German DKW RT 125. The YA-1 was a competitive success at racing from the beginning, winning not only the 125cc class in the Mt. Fuji Ascent, but also sweeping the podium with first, second and third place in the All Japan Autobike Endurance Road Race that same year. Early success in racing set the tone for Yamaha, as competition in many varieties of motorcycle racing has been a key endeavor of the company throughout its history, often fueled by a strong rivalry with Honda and other Japanese manufacturers. Yamaha began competing internationally in 1956 when they entered the Catalina Grand Prix, again with the YA-1, at which they placed sixth. The YA-1 was followed by the YA-2 of 1957, another 125cc two stroke, but with significantly improved frame and suspension. The YD-1 of 1957 was a 250cc two-stroke twin cylinder motorcycle, resembling the YA-2, but with a larger and more powerful motor. A performance version of this bike, the YDS-1 housed the 250cc two-stroke twin in a double downtube cradle frame and offered the first five-speed transmission in a Japanese motorcycle. This period also saw Yamaha offer its first outboard marine engine. By 1963 Yamaha's dedication to both the two-stroke engine and racing paid off with their first victory in international competition, at the Belgium GP, where they won the 250cc class. Success in sales was even more impressive, and Yamaha set up the first of its international subsidiaries in this period beginning with Thailand in 1964, and the Netherlands in 1968. 1965 saw the release of a 305cc two-stroke twin, the flagship of the company's lineup. It featured a separate oil supply which directly injected oil into the gasoline prior to combustion (traditionally riders had to pre-mix oil into gasoline together before filling the gas tank on two stroke engines). In 1967 a new larger displacement model was added to the range, the 350cc two stroke twin R-1. In 1968 Yamaha launched their first four-stroke motorcycle, the XS-1. The Yamaha XS-1 was a 650cc four-stroke twin, a larger and more powerful machine that equaled the displacement and performance of the popular British bikes of the era, such as the Triumph Bonneville and BSA Gold Star. Yamaha continued on with both the two-stroke line and four-stroke twins at a time that other Japanese manufacturers were increasingly moving to four cylinder four-stroke machines, a trend led by Honda in 1969 with the legendary CB-750 four-stroke four-cylinder cycle. Not until 1976 would Yamaha answer the other Japanese brands with a multi-cylinder four stroke of their own. The XS-750 (and later 850) a 750cc triple cylinder machine with shaft final drive was introduced almost seven years after Honda's breakthrough bike. Yamaha's first four-cylinder model, the XS-1100 followed in 1978, again with shaft drive. Despite being heavier and more touring oriented than its rivals it produced an impressive string of victories in endurance racing. The 1970s also saw some of the first dedicated off-road bikes for off-road racing and recreation. Yamaha was an early innovator in dirt-bike technology, and introduced the first single-shock rear suspension, the trademarked "Monoshock" of 1973. It appeared in production on the 1974 Yamaha YZ-250, a model which has continued in production, with many updates, until 2015, making it Yamaha's longest continuous model and name. Yamaha continued racing throughout the 1960s and 1970s with increasing success in several formats. The decade of the 1970s was capped by the XT500 winning the first Paris-Dakar Rally in 1979. By 1980 the combination of consumer preference and environmental regulation made four strokes increasingly popular. Suzuki ended production of their GT two stroke series, including the flagship water-cooled two-stroke 750cc GT-750 in 1977. Kawasaki, who had considerable success throughout the 1970s with their two-stroke triples of 250cc, 350cc, 500cc and 750cc ended production of road-going two strokes in 1980. Yamaha bucked this trend and continued to refine and sell two-strokes for the street into the 1980s. These bikes were performance oriented, water-cooled twin cylinder machines, designed to achieve excellent performance taking advantage of the lower weight of two strokes. The RZ-250 of 1980 was the progenitor of this series. The RZ-350, the largest displacement model, was a popular hot-rod bike of the 1980s and continued to be sold in some countries into the early 1990s. Throughout the 1980s the motorcycle industry gradually went from building a few basic but versatile models designed to work well in many roles, to offering many more specialized machines designed to excel in particular niches. These included racing and performance street riding, touring, motocross racing, enduro and recreational off-road riding, and cruising. Yamaha branched out from the relatively small number of UJMs (Universal Japanese Motorcycle) at the start of the decade to a much larger set of offerings in several clearly defined markets at the end of the decade. 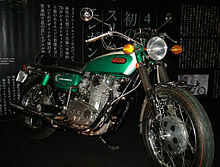 The XV750 of 1981 featured an air-cooled V-twin four stroke engine and cruiser styling, and was one of the first Japanese cruiser style motorcycles. By the end of the 1980s Yamaha had offered dozens of cruiser styled bikes in a variety of displacements and engine configurations. The RZV500 was one of the first "repli-racers", a near copy of Kenny Roberts competition GP bike, it featured a liquid-cooled two-stroke motor of 500cc displacement in a V4 configuration, along with a perimeter frame and full fairing. A more popular and practical high-performance model for the street was introduced in 1985, the FZ750. It was an innovative 750cc four-stroke inline four cylinder model. It was the first motorcycle to feature a five valve cylinder head, something Yamaha became well known for. It also featured a cylinder block canted forward at 45 degrees, and a box-section steel perimeter frame. Production of the FZ continued until 1991. In 1998 Yamaha marketed a 1000cc four cylinder road bike called the YZF 'R1', this model introduced a new style of gearbox design which shortened the overall length of the motor/gearbox case, to allow a more compact unit. This, in turn allowed the motor to be placed in the frame further forward, designed to improve handling in a short wheel-based frame. In 1995, Yamaha announced the creation of Star Motorcycles, a new brand name for its cruiser series of motorcycles in the American market. In other markets, Star motorcycles are still sold under the Yamaha brand. This was an attempt to create a brand identity more closely aligned with the cruiser market segment, one of the largest and most lucrative in the USA. In 2007, Yamaha established the Philippine operations and distributes Yamaha motorcycles under the corporate name of Yamaha Motor Philippines, Inc., one of more than 20 worldwide subsidiaries operating on all continents. India Yamaha Motor Private Limited (IYM) is the wholly owned Indian subsidiary of Yamaha Motor company, headquartered at Chennai, India. Yamaha Motor Company Japan made its initial foray into India in 1985 as a joint-venture with Escorts Group. In August 2001, it became a 100% subsidiary of Yamaha Motor Co., Ltd. Japan (YMC). In 2008, Mitsui & Co., Ltd. entered into an agreement with YMC to become a joint-investor in India. It produces a range of motorcycles for domestic consumption and export including the FZ, SZ, Saluto, Fazer, and YZF. Yamaha own three plants for manufacture of two-wheelers in India: one in Faridabad, Haryana, one in Surajpur, Uttar Pradesh, and one in Chennai, Tamilnadu. It is from these three plants that Yamaha handles production of motorcycles and parts for both domestic as well as overseas markets. While the Faridabad plants was started in 1965, the Surajpur plants followed with its inception in 1984 and Chennai in 2014. The scooters manufactured by Yamaha in India are the Yamaha Ray and its upgrade, the Yamaha Ray Z, Alpha, Fascino. Three-time Grand Championship winner Kenny Roberts at the 1981 German Grand Prix. In motorcycle racing Yamaha has won 39 world championships, including 6 in MotoGP and 9 in the preceding 500 cc two-stroke class, and 1 in World Superbike. In addition Yamaha have recorded 208 victories at the Isle of Man TT and head the list of victories at the Sidecar TT with 40. Past Yamaha riders include: Jarno Saarinen Giacomo Agostini, Bob Hannah, Heikki Mikkola, Bruce Anstey, Kenny Roberts, Eddie Lawson, Wayne Rainey, Jeremy McGrath, Stefan Merriman, Dave Molyneux, Ian Hutchinson, Phil Read, Chad Reed, Ben Spies and Jorge Lorenzo. Their current lineup consists of nine-time world champion Valentino Rossi and Maverick Viñales. The Yamaha YZ450F won the AMA Supercross Championship two years in a row, in 2008 with Chad Reed, and 2009 James Stewart. Yamaha was the first to build a production monoshock motocross bike (1975 for 250 and 400, 1976 for 125) and one of the first to have a water-cooled motocross production bike (1977 in works bikes, 1981 in off-the-shelf bikes). Yamaha's first Motocross competition four-stroke bike, the YZ400F, won the 1998 USA outdoor national Championship with factory rider Doug Henry. Since 1962, Yamaha made production road racing Grand Prix motorcycles that any licensed road racer could purchase. In 1970, non-factory privateer teams dominated the 250 cc World Championship with Great Britain's Rodney Gould winning the title on a Yamaha TD2. Yamaha also sponsors several professional ATV riders in several areas of racing, such as cross country racing and motocross. Yamaha has had success in cross country with their YFZ450, ridden by Bill Ballance, winning 9 straight titles since 2000. Yamaha's other major rider, Traci Cecco, has ridden the YFZ450 to 7 titles, with the first in 2000. In ATV motocross, Yamaha has had success with Dustin Nelson and Pat Brown, both who race the YFZ450. Pat Brown's best season was a 3rd place title in 2007, while Nelson has had two 1st place titles in the Yamaha/ITP Quadcross, one in 2006 and the other in 2008. Yamaha produced Formula One engines from 1989 to 1997, initially for the Zakspeed team, in 1991 for the Brabham BT60Y, in 1992 for the Jordan 192, from 1993 to 1996 for Tyrrell, and in 1997 for the Arrows A18. These never won a race, but drivers including Damon Hill, Ukyo Katayama, Mark Blundell and Mika Salo scored some acceptable results with them. However their engines were often unreliable and were usually regarded as not very powerful. Yamaha has built engines for other manufacturers' vehicles beginning with the development and production of the Toyota 2000GT (1967). The cylinder head from the Toyota 4A-GE engine was developed by Yamaha and built at Toyota's Shimayama plant alongside the 4A and 2A engines. In 1984, executives of the Yamaha Motor Corporation signed a contract with the Ford Motor Company to develop, produce, and supply compact 60° 3.0 Liter DOHC V6 engines for transverse application for the 1989–95 Ford Taurus SHO. From 1993 to 1995, the SHO engine was produced in 3.0 and 3.2 Liter versions. Yamaha jointly designed the 3.4 Liter DOHC V-8 engine with Ford for the 1996–99 SHO. Ford and Yamaha also developed the Zetec-SE branded 4-cylinder engines used in several Ford cars like the small sports car Ford Puma. From 2005 to 2010, Yamaha produced a 4.4 Litre V8 for Volvo. The B8444S engines were used in the XC90 and S80 models, whilst also adapted to 5.0L configuration for Volvo's foray into the V8 Supercars with the S60. British sportscar maker Noble also uses a bi-turbo version of the Volvo V8 in their M600. All performance-oriented cylinder heads on Toyota/Lexus engines were designed and/or built by Yamaha. Some examples are the 1LR-GUE engine found on the 2010–2012 Lexus LFA, the 2UR-GSE found in Lexus ISF, the 3S-GTE engine found on the Toyota MR2 and Toyota Celica Toyota Celica GT4/All-Trac, the 2ZZ-GE engine found on the 1999–2006 Toyota Celica GT-S and Lotus Elise Series 2, and the Toyota 4GR-FSE engine found on the Lexus IS250. Yamaha also tunes engines for manufacturers, such as Toyota, so Yamaha logos are on Toyota S engines. In 2007, Yamaha became the only snowmobile manufacturer to use a four-stroke only across its line-up (in the United States only – the VK 540 model remained available as a 2-stroke in other markets). Yamaha had introduced 4-strokes to their line-up in 2003 with the release of the RX-1. This 4 cylinder model became the first performance-oriented 4-stroke snowmobile on the market (it was not the first modern 4-stroke snowmobile produced - that honor belongs to Arctic Cat for their Yellowstone Special (released in 2000), which was designed as a rental sled that could meet Yellowstone National Park's stringent emission requirement). However, Yamaha received much criticism for its weight disadvantage when compared to similar 2-strokes, despite its fuel economy and low-range torque. Yamaha further used 4-stroke technology to introduce the 80FI engine equipped in the Phazer and Venture Lite models in order to provide small displacement, lower horsepower models marketed towards smaller riders. This engine had one of the highest specific output of any 4-stroke in production, with 160 HP/L. Yamaha achieves this even without the use of a forced induction system. Yamaha is also a key player in the "4-Stroke Wars", which are a series of advertisements from opponent Ski-Doo, who claim their E-Tec-equipped 2-strokes are still cleaner and more efficient than 4-strokes, while Yamaha claims the 4-strokes are cleaner and more reliable. Yamaha also broke a multi-year absence from sno-cross in the winter of 2006/2007 with their introduction of a factory race team headed by former Arctic Cat racer Robbie Malinoski. Yamaha was the first brand to win with a 4-stroke snowmobile in a professional snowcross race during 2006 at the WPSA Snowcross Championship. In a partnership with Arctic Cat (now owned by Textron), Yamaha Motor Company supplies the 1,050cc 3-cylinder (135+ HP) and 998cc 3-cylinder turbocharged (180+ HP) engines for use in a collaborative chassis sold under each brand name. While there are similarities between the respective manufacturers' models, small differences can be noted. SR Viper (Arctic Cat 7000-series equivalent) and SideWinder (Arctic Cat 9000-series equivalent) models are equipped with Yamaha clutches and changes to certain plastic body panels (such as the color, suspension set-up, windshield and intercooler housing on turbocharged models). The suspension layout, chassis, gauge package, and handlebar switchgear remain the same for both Yamaha and Arctic Cat snowmobiles. This partnership was established for the 2014 model year with the introduction of the 2014 SR Viper and Arctic Cat 7000-series line-up. In 2017, Arctic Cat and Yamaha introduced the world's most powerful snowmobile engine with the release of the SideWinder and 9000-series line-ups. Historic "Japan Built" models (such as the Apex and RS Vector lineups) and most SR Viper models were removed from production to support the sale of "hold-over" units from previous models years at MSRP. This was a new move to the industry in order to support dealerships and sell the large number of previous model year snowmobiles that have remained unsold. ^ "Stock Information". yamaha-motor.com. Yamaha Motor Company. Retrieved 29 January 2016. ^ "Yamaha Motor Establishes Highly Profitable Business Structure". businesswire.com. Retrieved 2017-02-15. ^ "Yamaha Motor Establishes Highly Profitable Business Structure". finance.yahoo.com. Retrieved 2017-02-15. ^ "二輪車・バイク業界の動向・ランキング等を研究-業界動向サーチ" [Research on trends and rankings of motorcycles · motorcycle industry - industry trend search]. gyokai-search.com (in Japanese). Retrieved 11 November 2017. ^ "Yamaha, marine business earns earnest and leverages motorcycle know-how". nikkei.com. Nihon Keizai Shimbun. September 17, 2013. ^ "Yamaha Motorcycles and Brand History". autoevolution.com. SoftNews NET. Retrieved 15 January 2015. ^ "Yamaha Showroom Communication Plaza Collection". yamaha-motor.com. Yamaha Motors. Retrieved 15 January 2015. ^ "Yamaha Collection – YDS-1". Yamaha-Motor.com. Retrieved 15 January 2015. ^ "Yamaha Collections: XS-1100". yamaha-motor.com. Yamaha Motors. Retrieved 16 January 2015. ^ Melling, Frank. "Memorable MC: 1974 Yamaha YZ250M Monoshock". Motorcycle USA LLC. Retrieved 16 January 2015. ^ "Dakar Retrospective 1979–2007" (PDF). Dakar.com. Archived from the original (PDF) on 15 May 2011. Retrieved 29 April 2011. ^ "Yamaha Motors Collection RZ-250". yamaha-motor.com. Yamaha Motors. Retrieved 16 January 2015. ^ "Yamaha Collection: RZV500R". yamaha-motor.com. Yamaha Motors. Retrieved 16 January 2015. ^ Vandenheuvel, Cornelis (1997). Pictorial history of Japanese motorcycles. MBI Publishing Company. pp. 84–90. ISBN 978-1-870979-97-9. ^ a b "Machines - Isle of Man TT Official Website". iomtt.com. Retrieved 11 November 2017. ^ "Yamaha Outboards". yamaha-motor.com. Yamaha Motors. Retrieved 11 November 2017. ^ "Yamaha Motorcycles for Sale - Sydney's #1 Yamaha Dealer | Bikebiz". www.bikebiz.com.au. Retrieved 2018-11-28. ^ "Intelligent Machinery – Company information". yamaha-motor.co.jp. Yamaha Motors. Archived from the original on 2011-12-16. Retrieved 2011-12-27. ^ All About the Toyota Twin Cam (2nd ed.). Tokyo: Toyota Motor Company. 1984. p. 24. Retrieved 2012-12-06. ^ "SHO n Tell". fordmuscle.com. Jon Mikelonis and Matt Wilder. Retrieved 2008-04-04. ^ 1989 Ford Taurus SHO commercial. Ford Motor Company. Retrieved 2007-07-19 – via retrojunk.com. ^ "Toyota Twin-Cam Evolution". Toysport.com. Archived from the original on 2009-06-26. Retrieved 2009-07-14. Wikimedia Commons has media related to Yamaha Motor Company.